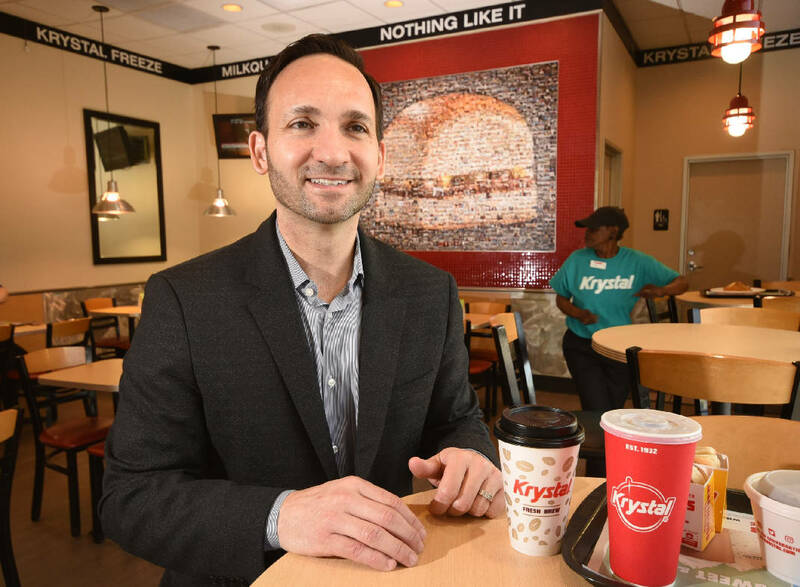 Paul Macaluso, CEO of Krystal restaurants, talks about trying to boost profits after taking the helm of the Atlanta based company during an interview inside the Broad Street location in Chattanooga Monday morning. Longtime employee Pat "Miss Pat" Lawson is seen in the dining area, at right. After two years of falling sales, Krystal has a new CEO determined to turn around one of America's oldest fast food restaurant chains. Paul Macaluso, a 27-year veteran manager at Taco Bell, Burger King, Sonic Drive-in, Moe's Southwest Grill and McAllister's, said he jumped at the chance this spring to join Krystal, which he says is one of the most iconic brands in the industry. "This was just too great of an opportunity to pass up the chance to help a great brand that I grew up with in central Florida and have such great memories about," the 48-year-old Orlando, Florida,. native said. "We're at a point now where we are in a bit of a turnaround situation and I love being part of a team to help revitalize the brand." Founded in 1932 in downtown Chattanooga, Krystal is the nation's second oldest fast-food chain (behind only White Castle started in 1921) and operates 364 restaurants in 11 states. In spite of the improving economy — or perhaps because of it — Krystal sales have dropped in each of the past couple of years and the chain previously pulled out of Texas and hasn't added new stores in years. During the company's biannual convention this week in Chattanooga, Macaluso told Krystal's top managers, suppliers and franchisees that he is determined to grow the company this year with new and remodeled stores, a more value-oriented menu and new scholarship and benefits to help recruit and retain staff. Macaluso, the fourth CEO of Krystal in as many years, concedes it will be a challenge to improve operations while cutting some prices and spending more on new stores, more marketing and better wages for many employees. But he says such changes are overdue and should help ensure that that 86-year-old brand stays fresh and relevant for another 86 years. 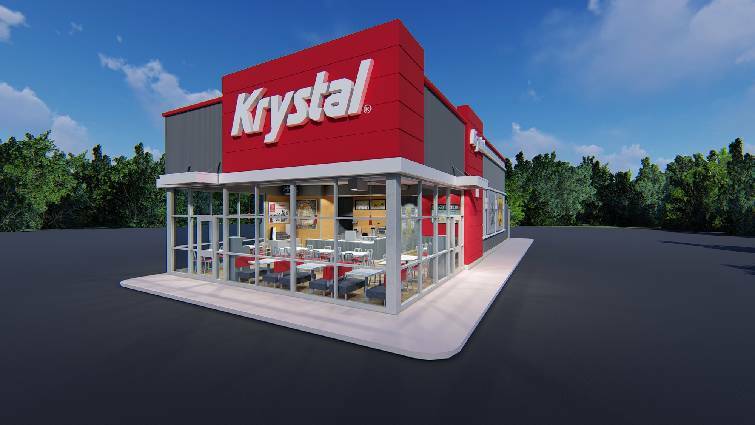 Krystal plans to renovate 50 or more of its restaurants this year and add at least a couple new company-owned stores this year — the first new Krystal restaurants added in several years. The new store model has fewer interior seats and more drive-through window space, reflecting the fact that 70 percent of Krystal's sales come through its drive-through window and the likelihood that new restaurant delivery services such as Uber and WATR will mean an even bigger share of meals will be consumed off of the restaurant premises in the future. The company is also eager for its franchisees to gain more territorial flexibility to add more stores, Macaluso said. For now, Krystal is staying within its 11-state region in the Southeast where Macaluso said the restaurant chain sees opportunities for as many as 200 more restaurants. "Long term, we hope to expand outside of our current footprint, but that is not our immediate focus because we think here are lots of opportunities in the markets where we already are in," he said. Krystal also recently debuted a new value pricing model. Krystal's new Davenport prototype store will replace more than 50 current Krystal outlets being rebuilt over the next several years. Famous for its small, square hamburgers, Krystal has always been a value-oriented restaurant chain. But as McDonald's, Burger King and Wendy's have all adopted and touted value pricing models in recent years, Krystal decided this spring to launch a new $2, $3 and $4 value meal offerings. Krystal is offering two Krystals and a small order of fresh fries for just $2 in one of the lowest price fast food meal offerings now on the market. The most popular item is proving to be the $3 meal with three Krystals, an order of fries and a drink. Krystal has had its "5 mix for $5" offering for several years, but Macaluso wanted to offer even more value. "We are seeing all three of the big players (McDonald's, Burger King and Wendy's) having success with their value meals so we wanted to freshen our offerings and provide an even greater value," he said. "The results so far of our new $2, $3 and $4 pricing have been very encouraging." The Krystal menu also will expand this summer with pimento cheese bites, coming by late June either as a side item or on top of a Krystal. Later this year, Krystal plans to add a honey-buttered chick sandwich, a maple bourbon-flavored shake and a LemonHead slush. To promote itself, Krystal recently hired the Knoxville-based Tombras Group as its new marketing agency to help expand its social and digital media promotions. "Krystal is the original challenger brand and we're going to make sure we regain share of minds and hearts with our guests," he said. For Krystal workers, the restaurant chain announced Tuesday night that it is starting a college scholarship program known as the Square Up foundation for its workers, funded with a $500,000 contribution over the next five years from the CEO of Krystal's parent company, Argonne Capital Group founder Michael Klump. The company will offer grants of up to $2,500 a year for selected employees and will begin taking applications later this year. The scholarship program, combined with the Krystal Foundation created in 2016 to make contributions to local schools, should help Krystal's brand identity and the communities where it operates, Macaluso said. The scholarships, free meals and recent wage increases also should help Krystal be more competitive in filling the more than 6,500 jobs the company and its franchisees have across the Southeast. "This is the toughest job market in my career in the restaurant industry, but we're working to make Krystal more of a employer of choice and to reduce our turnover rate," Macaluso said. "We're investing in our people because we know when our employees are happy and there is less turn over we can offer a better guest experience and we will do our job better." In Chattanooga, where Krystal maintained its corporate headquarters from 1932 to 2013, the company still has more than 600 employees even after its corporate offices moved to Atlanta. Macaluso said he wanted to have this year's convention in Chattanooga "where it all began and is still our home in many ways." Klump praised Macaluso as "sharp, action-oriented and innovative. "We're all looking forward to his winning attitude and his ability to drive outstanding relationships and results," Klump said.